Signed: Dial signed; caseback and movement stamped with No. 4296. Accessories: Accompanied by Breguet Certificate confirming the sale of the present wristwatch to Monsieur Gaffé on 17 May 1941 for the amount of 6,800 Francs. Certain design cues are so imbedded in the DNA of a watch manufacture that it is hardly necessary to print the name on the dial. Such is the case with Breguet, who, since 1775, have artfully utilized the combination of a guilloché dial, blued steel “pomme” hands, and delicate Roman numerals on so many of their iconic pieces. The present lot is no different, a stunningly simple execution of these aesthetic traits cased in a beautifully well-preserved yellow gold case with coin-edge detailing. 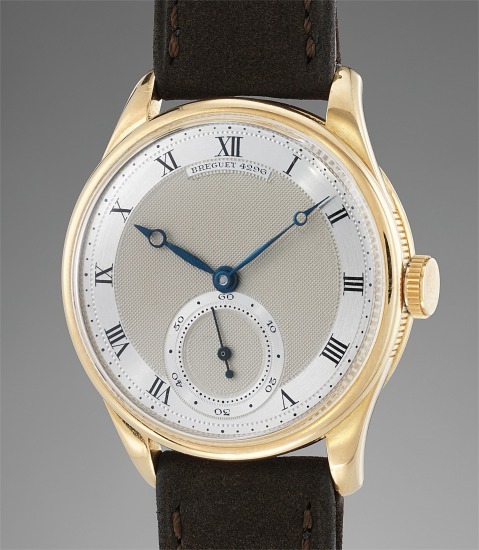 Breguet’s production of wristwatches during the 1930s and 1940s was very limited, owing to the aftermath of the Great Depression followed by the ravages of World War II. It is likely that barely a handful of gold wristwatches were manufactured and delivered during this time, leading one to assume that the delivery of this timepiece on May 17th, 1941, with German forces occupying much of France, was an exceptional occurrence. Dial signed; caseback and movement stamped with No. 4296.